Here, we will take a look at US Rail Traffic to give us a clue about the state of the US economy​​. Week 8 of 2014 ending February 22 shows same week total rail traffic above 2013 levels according to data released by the Association of American Railroads (AAR). Seven of the 10 carload commodity groups posted increases compared with the same week in 2013, including grain with 23,175 carloads, up 24.4 percent; and, petroleum and petroleum products with 15,211 carloads, up 13.1 percent. Commodities showing a decrease compared with the same week last year included metallic ores and metals with 22,539 carloads, down 1.8 percent. The Association of American Railroads (AAR) today reported increased U.S. rail traffic for the week ending Feb. 22, 2014 with 281,678 total U.S. carloads, up 1.3 percent compared with the same week last year. 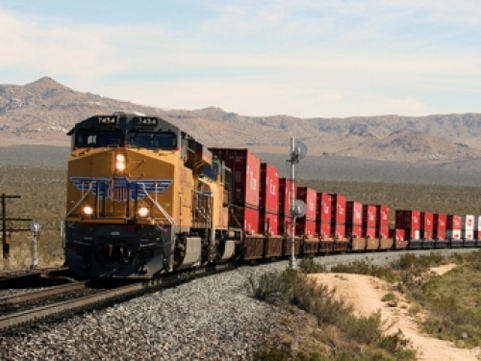 Total U.S. weekly intermodal volume was 253,358 units, up 6.4 percent compared with the same week last year. Total combined U.S. weekly rail traffic was 535,036 carloads and intermodal units, up 3.7 percent compared with the same week last year. 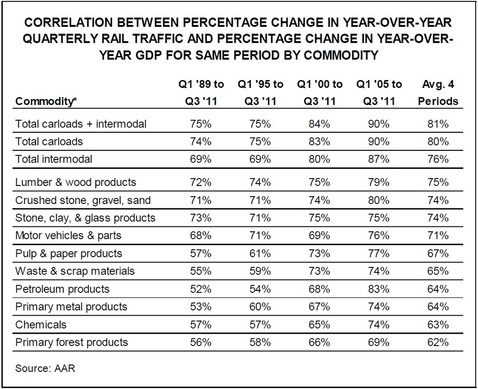 In 2013, 11 of the 20 carload commodity categories tracked annually by AAR saw increases on U.S. railroads compared with 2012. The categories with sizable gains were: petroleum and petroleum products, up 167,868 carloads or 31.1 percent; crushed stone, gravel and sand, up 81,023 carloads or 8.3 percent; motor vehicles and parts, up 41,166 carloads or 5.1 percent, and waste and nonferrous scrap, up 14,472 carloads or 9.1 percent. ​​​​The more “stuff” people and firms are buying, the higher rail traffic levels are likely to be. And the more “stuff” people and firms are buying (everything else equal), the stronger economic growth is likely to be. In theory, this makes rail traffic a useful gauge of broader economic activity. ​​But how true is this in practice? To help find out, we recently compared U.S. rail traffic by commodity back to 1989 (which is as far back as our data go) against GDP growth. Econometric models that attempt to quantify relationships between economic variables can be extremely complex. However, we intentionally kept the analysis very simple. ​​Specifically, we calculated the correlation between the percentage change in year-over-year quarterly rail traffic and the percentage change in year-over-year annualized quarterly U.S. GDP for four different time periods: Q1 1989 to Q3 2011; Q1 1995 to Q3 2011; Q1 2000 to Q3 2011; and Q1 2005 to Q3 2011. Correlation can range from -100% (a perfect negative correlation) to 100% (a perfect positive correlation). Perfect correlation (either positive or negative) between two economic variables never happens, but the closer a correlation is to one of the extremes, the stronger it is. ​​The table on the next page summarizes our results. In all four periods we examined, the traffic category “total carloads plus intermodal” had the strongest correlation with GDP. 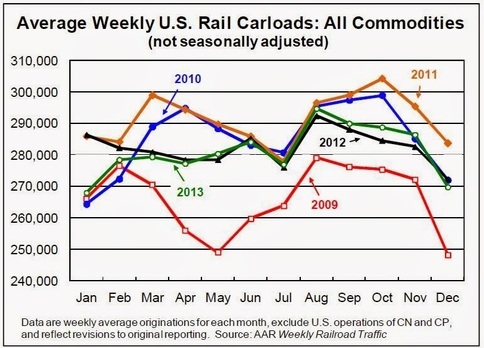 It’s average correlation for the four periods was 81%, ahead of “total carloads” (80%) and “intermodal” (76%). ​​The table on the right summarizes the results of that part of our analysis. For nearly all commodities, the correlation between rail traffic and GDP growth is weaker when the comparison is made to GDP one quarter later than to GDP for the current period. ​​ For example, for “total carloads plus intermodal,” the average correlation between rail traffic and GDP for the same period was 81%, but the average correlation between rail traffic and GDP one period later for was a much lower 68%. ​​The strongest average correlation for the four time periods examined between rail traffic in one period and GDP one quarter later was 77%, for the commodity “motor vehicles and parts.” This was one of the few commodities for which the average correlation was higher when traffic was compared to GDP one quarter later (77%) than when it was compared to GDP for the same quarter (71%). “Motor vehicles and parts” had the highest correlation for each of the four time periods examined, making it clearly the best single rail commodity to use as a gauge of near-term economic strength. In other words, rail traffic totals appear to better reflect how well the overall economy is currently performing than rail traffic for any individual commodity does. ​​Among individual commodity categories, the strongest average correlations over the four periods examined were “lumber and wood products” (75%), “crushed stone, gravel, and sand” (74%), and “stone, clay, and glass products” (74%). ​​We also were interested in finding out what rail commodities might be most useful as a gauge of future near-term economic health. To that end, we ran the numbers again, but this time we calculated the correlation between the percentage change in year-over-year rail traffic for various commodities and the year-over-year percentage change in GDP one quarter later. ​​For example, year-over-year changes in rail traffic from Q1 1989 through Q2 2011 were compared to yearover- year changes in GDP from Q2 1989 through Q3 2011. 2)​​​​​ “Motor vehicles and parts” had the highest correlation for each of the four time periods examined, making it clearly the best single rail commodity to use as a gauge of near-term economic strength. 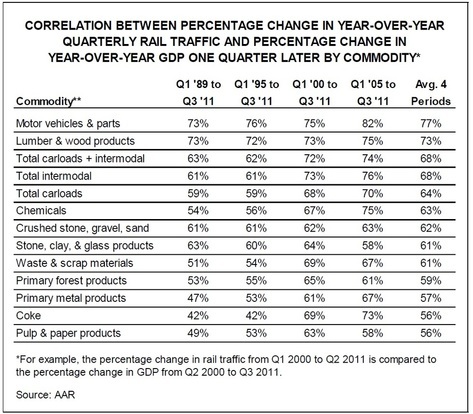 In 2013, 11 of the 20 carload commodity categories tracked annually by AAR saw increases on U.S. railroads compared with 2012. The categories with sizable gains were: Motor Vehicles and Parts up 41,166 carloads or 5.1 percent. Are US Rail Traffic Telling Us to Expect a Mixed Economic Activity ?